I have played with this cognomen over the years by identifying the mainstream media (MSM) with various appellations such as the Ministry of (mis)Information, and MinInfo whenever MSM's manner of coverage of a story revealed its bias favoring most any form of statism. Over the last two years, unlike any time in my long life, the MSM has warranted the name Ministry of MisInformation more than ever. It got to be an open joke among my acquaintences of how open the bias could get. "Have they gotten around to framing every picture of Bush wearing a dunce cap?" "It can't be long before every frame of Obama has him walking on water." As the bailouts came into play last year, I observed that once news sources like the AP and newspapers like the NY Times were bailed out, they would be well along to becoming official state organs along the lines of the USSR's Izvestia and Pravda, reporting and printing only what those holding their purse-strings wished to see made known. America got to its current state because of permanent government deficit finance, government debasement of the dollar, government redistribution, and government meddling in the economy, most particularly the credit market. Not one of these things was contemplated by the Founders or authorized by the Constitution of the United States. Washington proceeded with them anyway. Not one economist of any standing would disagree that our troubles are rooted in the very policy arrogances I just enumerated. But politicians, to whom government is the one and only "solution" to any and every "problem," have proposed that we address our difficulties by intensifying the very practices that produced them. It is a sad fact that such a concise review of the why, and excuses for, the Obama stimulus and the TARP before it, can only be found on a relatively obscure website. Nowhere in the MSM are they discussed as a consistent group of related issues where logic would bring the listener or reader to Fran's conclusion. The fact these facts are never allowed to be built into an argument filled with legitimate observations and concerns anywhere in MSMdom tells us how in love with total state control visible MSM employees either are (true-believers) or think they must demonstrate they are (cynical self-servers). With such able employees already well stationed in various MSM outlets, how soon before the Ministry of Truth emerges, fully grown and indomitable? Stimulus Package ► $5 Billion to community groups ►A.C.O.R.N. gets its share (thanks to A.C.O.R.N. friend Obama) ►A.C.O.R.N. diverts much of that money to defend itself from voter fraud charges ►A.C.O.R.N. outspends states' attorneys and gets charges dropped ►A.C.O.R.N. continues as before, undeterred, invigorated. Even FactCheck.org, a website with indirect connections to A.C.O.R.N. through The Annenberg Foundation, cannot dispute the above formula. This may be seen from reading its answer to questions about A.C.O.R.N. receiving funds from the stimulus package. The bill does include funds for which ACORN would be eligible to compete - against hundreds of other groups. Right. Which would incline a fair and impartial judge to ask: "How many of those hundreds of other groups has a former member and grateful friend in the White House?" This serves as an update to my last post in which I posted the following cartoon. 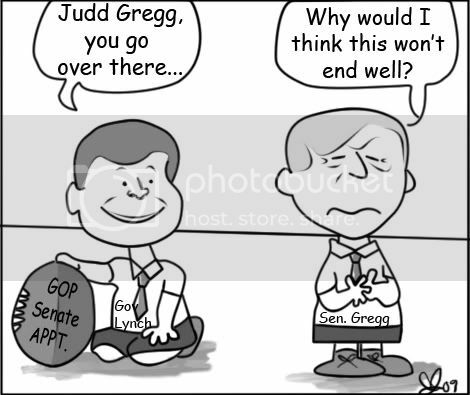 According to news released shortly ago, Senator Judd Gregg withdrew his nomination for Secretary of Commerce. An administration official said Gregg dropped out without warning for a position that he had expressed interest in just a few weeks ago. Heh, heh. Maybe Obama's decision to let White House Chief of staff Rahm Emanuel to run the 2010 census in violation of our constitution had something to do with Senator Gregg's decision. It has been viewed as an unprecedented WH power grab. The WH plan to run the census instead of the commerce department did not come to light until after Senator Gregg's nomination had been announced and he had accepted. Perhaps my cartoonist should redraw this piece by inserting a caricature of President Obama where Governor Lynch is depicted now. The unexpected withdrawal marked the latest setback for Obama in his attempt to build a Cabinet. 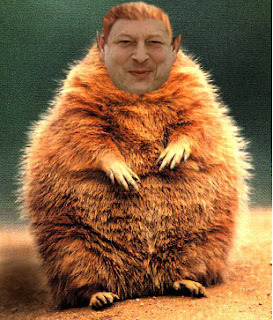 Had Mayor Bloomberg celebrated Al Gore Day today as I had proposed, he could have avoided this. Alternate for when this embed gets pulled due to mikey bloomberg's thin skin is here. Although Al Gore is known to walk all over RINOs, he's never been known to bite one.